Offers comprehensive coverage of the latest developments in both biochemical and physiological approaches to fungal systematics. Incorporates recent advances in molecular biology into systematics methods that can revolutionize taxonomic schemes. ". . .an excellent reference book for all mycologists." ". . .indispensable for all libraries used by mycologists, ecologists, soil mycologists, industrial scientists, plant pathologists and scientists of related disciplines. " ". . .a valuable and. . .up-to-date summary of the state of the art." 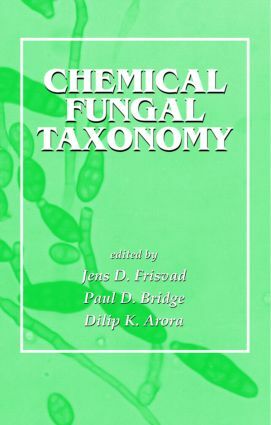 Chemical fungal taxonomy - an overview; numerical analysis of fungal chemotaxonomic data; use of PCR and RFLP in fungal systematics; proteins in fungal taxonomy; the use of isoenzymes in fungal taxonomy and population studies; fungal immunotaxonomy; taxonomic applications of polysaccharides; chemotaxonomy of fungi by unsaponifiable lipids; fatty acids in fungal taxonomy; carbohydrates and their impact on fungal taxonomy; volatiles in fungal taxonomy; the role and use of secondary metabolites in fungal taxonomy; expression of secondary metabolite characters in relation to the conditions of growth; the taxonomic use of metabolic data in lichen-forming fungi.